We have a train under a footbridge at a station. Am sure someone can expand on that - where, what engine, type of train? The three NPCS vehicles at the front are Great Western, and while it is hard to tell the carriage profile looks GWR as well. The footbridge looks GWR as well. Guess taken on the Birkenhead Joint Line? The photo was taken in post-grouping days as the headlamp code conforms to the 1925 LMS specifications � Class 3 Parcels, Newspaper, Fish, Meat, Horse or perishable train composed of coaching stock. The architecture looks like Helsby on the joint Warrington to Chester line. I don�t think it is Helsby. Photo attached. (click on photo above to see larger photo and attached photo from Philip). From a slightly sharper print at least the engine can be identified as No 2164 'Oberon', a Precursor of 1904 as rebuilt in 1913 with superheater and piston valves. 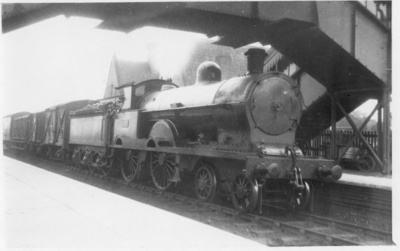 It was given its LMS number 5277 in November 1927, so the date of the photo should be 1925-7. So far so easy, but I simply have no ideas about where it might have been taken.